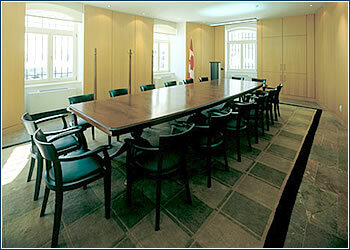 In December 2002, the Canadian Embassy officially moved from their 50-year old residence on Mickiewiczova street in Hradčany into its new premises on Muchova 6. The move not only brings staff into the embassy district of Bubeneč, but into a turn-of-the-century building with a hip and modern interior. DESIGN of the embassy required that architects Auckett take into account both Czech and Canadian building standards. For example, Canada’s very strict requirements on fire safety and for allowing disabled people access to everywhere in the building, set this apart from other European projects. Toronto architects Diamond & Schmidt advised Auckett on Canadian norms. The reception hall is open and simplified from the previous building design, which involved going down, then up, stairs into a separate room. Now it is barrier-free and doubles as an entertainment area for social events. Different types of lighting from several sources can be adjusted to create different moods for various settings. 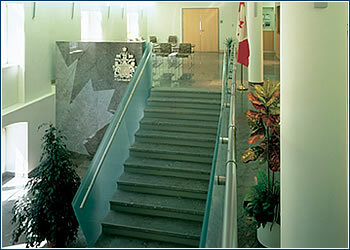 The architect’s use of the Canadian maple leaf symbol on Czech marble may provoke inferences to embassy visitors and staff. The symbol is formed by the contrast of polished and rough surfaces. For this and the floors, the architect was able to source one of the last deliveries of Czech Slivanecký marble. 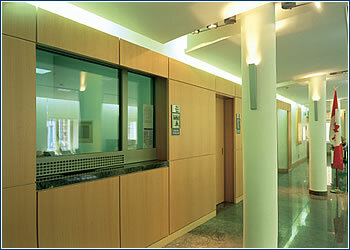 The interface between the public and private sections of the embassy, of which interview rooms form a part, feature air-lock door systems and bulletproof walls. Copier, fax, and printers are in a central island to allow for personal interaction without the confines of a copy room, at the same time leaving more windows for offices. 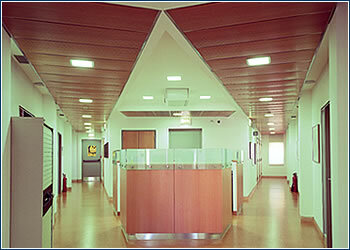 The overall design optimizes openness in an embassy where open plan offices are not possible. 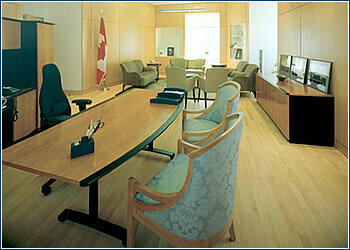 The meeting room and ambassador’s office feature beechwood cladding; further beech complements are used throughout the embassy. How does this building compare to the previous premises in terms of functionality as an embassy? In terms of working environment, we are delighted. The staff were chagrined to be working under the tight-packed conditions on Mickiewiczova, but here it’s much better in terms of lighting and space. The overall advantage is its functionality, with both interview and meeting rooms for example, which we did not have before, and a grand reception area that can host special events. What were some of the unusual aspects of this reconstruction? It was supposed to be at first just a simple reconstruction, but the structural survey showed that the previous reconstruction in 1995 had covered up structural problems and caused more with the excessive use of concrete. The construction firm, Konstructiva Konsit, was very good, and was coming up with suggestions of its own on how to solve problems. It proved necessary to gut the entire building, except for the only historical feature left after the 1995 reconstruction, the old staircase. In the end, however, this gave us a clean slate to work from in harmonizing the two countries’ norms and meeting the embassy’s goal of a space that was attractive and functional but not ostentatious.